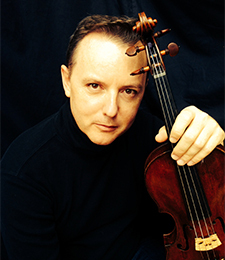 Bernard Zinck, concert violinist and recording artist, is currently Associate Professor of violin and chamber music and Director of the Sorkin Chamber Music Institute at the University of Wisconsin-Milwaukee. In 2011, he created the Lakeside Chamber Music Workshop held each summer in the Chicago area. He is in demand as a coach and teacher, having served on the faculty of the Köhln Summer Institute in Montepulciano, the International Lyric Academy of Rome and the Tuscia Operafestival (Italy), the Swannanoa Chamber Music Festival, and Holly Trinity Summer Music camp in Haiti. He is regularly invited to conduct master classes and residencies in universities and conservatories throughout the world. Zinck began violin studies at the age of six at the National Regional Conservatory in his hometown of Tours, France. At the age of fifteen, he entered the Paris Conservatory and was awarded three years later first prizes in violin and chamber music; his mentors were Gérard Poulet, Geneviève Joy-Dutilleux, Tibor Varga, and Maya Glezarova. Admitted to the Juilliard School of Music as a Fulbright scholar in 1987, he finished his BM and MM degrees with Joseph Fuchs after only four years of study. In 2006, he earned a DMA from Temple University in Philadelphia with a thesis on the eighteenth-century French violinist Chevalier de Saint-George, a remarkable figure of the French Enlightenment whose compositions he has researched, lectured on and performed. He was invited to participate in Montreal's Black History Month in 2010, where he performed works by Saint-George. Bernard Zinck's concert career began when he won the 1992 Yehudi Menuhin Trust Award in Paris. His scintillating recordings of Szymanowski's Complete Works for Violin and Piano, Live From France and Uncommon Voices have won him a reputation as an expert interpreter of impressionist and contemporary music. He has a close affinity with the works of the European nationalist composers of the early twentieth century, but is equally committed to a repertoire ranging from Corelli to Coleridge-Taylor Perkinson. His talent and interpretive insight have made him a sought-after soloist and he has performed extensively in concerts and recitals in Europe, the United States, Canada, Mexico, Brazil, South Korea and Japan. Recent venues include the Théâtre du Châtelet and Athénée Théâtre Louis Jouvet in Paris, the Théâtre Impérial in Compiègne, Les Flâneries de Reims, Radio-France Montpellier and Rencontres Musicales de Calenzana (France); Brighton Arts (U.K.); Salzburg Mozarteum (Austria); Liszt Academy in Budapest (Hungary); Szymanowski Festival in Zakopane (Poland); Basilica San Clemente in Rome and Orsanmichele Church in Florence (Italy); Oscar Peterson Hall at Montreal Concordia University (Canada), the National Gallery and the Phillips Collection in Washington DC; the Bowdoin International Music Festival; and the Santa Fe Concert Association. He has appeared as guest soloist with many orchestras, including the New Mexico Symphony, the Princeton Chamber Players, the Orquesta Sinfónica de Chihuahua, the Porto Alegre, Unisinos, Caxias and Camargo Guarnieri Symphony Orchestras in Brazil, the Hungarian National Philharmonic, the Bohemia Symphony, the Radio-Television Orchestra of Romania, the New Opera Di Roma Orchestra and the Orchestre National de la Garde Républicaine in Paris. Bernard Zinck has appeared in numerous concert series in Chicago: Dame Myra Hess at the Cultural Center, Rush Hour at St. James Cathedral, St. James Cathedral Concerts, Cube, The Alliance Française, and was featured with members of the Chicago Chamber Musicians on WFMT “Live from Studio One”. In 2008, his performance at the Rush Hour concerts was featured on NBC Nightly News with Brian Williams. Bernard Zinck's artistry has been praised in terms such as "impeccable accuracy of pitch" and "formidable technique". The Strad Magazine noted his "round and opulent tone” and his "vibrato bringing moments of sheer ecstasy”, while Fanfare Magazine was impressed by the "singing, sensuous, sumptuous, shimmering” quality of his playing, which the French Figaro summed up in the expression "violon solaire”. Since 2002, Bernard Zinck plays a Giovanni Battista Rogeri violin, dated 1690 – a purchase made possible with the support of the Bass family.